EEG strikes again! 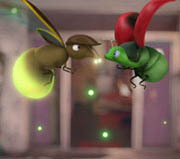 Bug Me Not is easily the best film ever featuring the tag team of Isabella Leong and CG-animated insects. It's also the only one. Thanks to the ill-conceived script, Bug Me Not! is a chore from minute one. Not even the Twins can save this movie. The Emperor Entertainment Group attempts to launch another movie star in the light kiddy flick Bug Me Not. Isabella Leong is EEG's latest ingenue, and she fits the bill nicely. The pretty Leong spends the majority of Bug Me Not making silly faces and generally overdoing the youthful exuberance. It's the standard package many ingenues deliver when they first burst upon the scene, and to be fair Leong could amount to more than just another EEG-funded pretty face. Her acting isn't noteworthy, but at least she isn't blankly uninteresting. She's still just a kid, so putting a fork in her career would be premature - plus it could stoke the flaming ire of her preteen fanbase. We don't want that, so we'll give Leong a chance. Too bad the movie isn't good. Moon (Isabella Leong) is a supposed misfit. When she was a kid she uttered baby speak for far too long, much to the concern of her mom (Candy Lo, playing above her age). Now a leggy teen, Moon is estranged for her utter weirdness, but she has a couple of things going for her. One, she's in love with Hyland (Wilson Chen), a local teen who works at a housewares store run by his pop (Lawrence Cheng). Two, Moon can talk to bugs. When she saves one-dotted ladybug Coochie (voiced by Hong Kong's go-to voice actor Jan Lam), she discovers that she and Coochie can hold a conversation. Soon she's got bugs singing her songs, plus helping her romance Hyland, who has serious problems with touching people. Can Coochie help Moon get close enough to Hyland to confess her feelings for him? Duh, the answer is yes, but there's other stuff going on. Moon's ability to yak with insects attracts the attention of Auntie (Gillian Chung), a 70 year-old woman who looks like one of those darn Twins girls. Auntie is impossibly mannered and dances the tango at odd moments, but she's also got superpowers, namely the ability to look young. She has a bunch of superpowered misfits working for her, including a pair of telekinetic twins (Zhou Bingqing and Zhou Yuejie), a high-jumping reverse-mohawked teen (Xu Boping), a clairvoyant semi-perv (Kenny Kwan, formerly of Boy'z), and an x-ray vision dude with long nostril hair (Steven Cheung, who's still stuck in Boy'z). Auntie wants Moon and Hyland to join her because they both have powers (Hyland's abilities involve pushing others out of his personal space), but both are hesitant. Meanwhile, the bugs are massing...for a dance number! If you think the above plot sounds coherent, then you should pass along whatever it is you're smoking. Really, Bug Me Not has no direction whatsoever, and limps along with no discernible rhyme, reason, or necessity. The storyline is a narrative hodgepodge that jumps between awkward teen romance, misfit superhero flick, Bug's Life ripoff, and the worst parts of a Wong Jing movie. The occasional song and dance numbers are limp and oddly placed, and the movie itself can't seem to decide what it wants to be. The main story seems to be about Coochie helping Moon confess her love, but when it detours into a possible confrontation between the bugs and humanity, one has to wonder where that came from. Bug Me Not is a piñata of mixed messages, ranging from "accept yourself" to "bugs are good" to "express yourself" to "even the Twins can't save a movie." Of all the above messages, only the last one is delivered convincingly. To complete the Twins appearance, Charlene Choi makes a token cameo as a misfit idol, who grins for the camera as if to say, "This is in my contract!" Well, it is in your contract, and Charlene, you've just fulfilled your duty. EEG and their associated conglomeration of lawyers, marketing personnel, and focus groups are proud of you. Who isn't proud? Probably director Law Chi-Leung, who has actually made solid films before with Inner Senses, Koma, and Double Tap. Those were commercial, yet slightly edgy films with a fine mixture of melodramatic bombast, ace acting, and effective thrills. All three of those elements are gone in Bug Me Not, and are replaced by saccharine sentiments, unimpressive performances, and a complete lack of tension. Bug Me Not is a waste of Law's talent, which isn't a surprise because if anyone decided the direction of this ill-conceived motion picture, it was EEG and not Law. Directing-for-hire isn't bad work if you can get it, though one wishes the final product channeled something besides a marketing playbook. Hopefully there's a Koma 2 in the works somewhere for Law to return to.